Put in the hard yards living on the streets with the hobos. Click here to play! You'll have to collect cans and change in order to get through the day. Though if you can spin the reels just right, you'll secure a fortune that will ensure your days of cardboard box living are over! Trash is a homeless dream! If you can spin two to five of these symbols across a pay line you'll get up to 7500 times your line bet. It also acts as a wild symbol that will substitute for all other symbols to help you win even more money. Keep an eye out for your fellow hobo, he acts as a jackpot symbol and will pay out up to 750 times your line bet if you can spin three to five. A hobo seeking shelter in a box is another jackpot symbol. Three to five of these guys will get you up to 500 times your line bet. 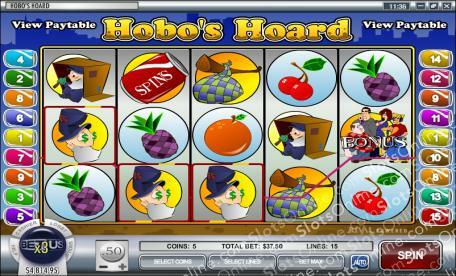 There are plenty of other symbols to help you gather some cash to end your hobo days, including the hobo sack, shopping carts and fruit. Cans are like gold in this game. Spin three to five of these empty colas and you'll get up to 50 times your bet. It will also get you up to 10 free spins. Crowds of yuppies are important, as three to five of these symbols will trigger a bonus feature in which you will be collecting quite a bit of cash! Can you survive the streets with the hobos? The soda cans act as a scatter. If you spin three to five of these, they will not only multiply your line bet, but will also trigger free spins. The trash cans act as a wild symbol. If you spin two to five of these and you'll get up to 7500 times your line bet. They also substitute for most other symbols to create more winning combinations. The crowd of yuppies acts as a bonus symbol. Three to five of them will pay out up to 50 times your line bet. They will also trigger a bonus feature in which you will choose from a selection of people for a chance to win a cash prize.